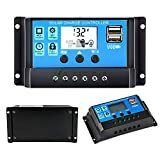 LCD SMART DISPLAY AND MULTI-SOCKETS: Designed with LCD smart display which could directly show you the battery voltage and output voltage clearly. DC and AC input. 4 AC and 1 USB output charging ports are perfect for powering lights, mobile phone, TV, hair drier, portable electric drill, waxing machine and so on. UPS FUNCTION CHARGING FOR YOUR BATTERY SIMULTANEOUSLY: Uninterruptible power supply function surge protection for desktop pc, workstations, networking devices and home entertainment systems. Safeguards valuable documents and files from damaging or losing due to power outage. 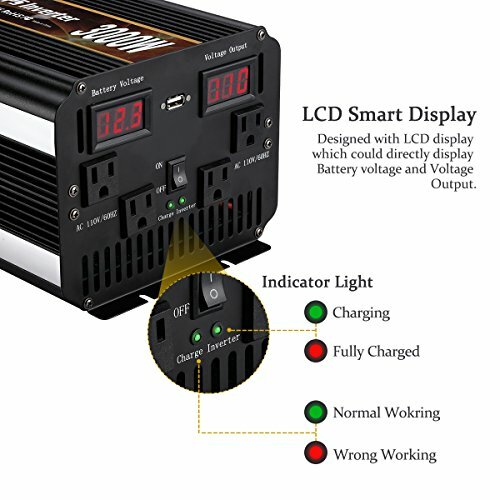 Charging for your battery simultaneously when you connect the inverter with AC input Power. MODIFIED SINE WAVE TECHNOLOGY 6000W PEAK POWER: Adopted with Modified Sine Wave technology which offers a more efficient power transmission to our daily life. Moreover, modified sine wave technology could extremely reducing the weight of inverter compare to traditional inverter. Up to 6000W power is available, it supports operating many electric facilities so that make battery a moveable power station. BUILT-IN FUSE AND SMART COOLING FAN PROTECTION: Protection system is premium because of the inverter built-in operation protection. Over current protection, over voltage protection, over heat protection, over-Power Protection, Short-Circuit Protection，Lightning Protection. Structured with dual cooling fan with temperature control system. Cooling will automatically operate when working temperature of inverter up to 45℃. VETOMILE BEU3000L adopted with modified sine wave technology which enhanced output performance via reducing loss of power. Peak power up to 6000W in order to satisfy most of electric facilities such as car light, car fridge, sawmill and so on. As a charger, this inverter could offer a powerful and stable power to many electric devices such as camera, smart phone and tablet. 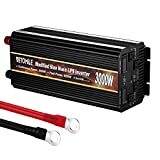 The most important is VETOMILE BEU3000L supports connect with city electricity so that provide power immediately when meeting S power failure. Structured with full protection contains over-voltage protection, over-current protection, over-heat protection and short circuit protection. 1.All electric appliances that exceed the rated power of the inverter. 2.Generally capacitive load and perceptual load appliances are inapplicability: air condition, high power electric drill, fridge, microwave oven, bender. 3.We do not recommend using this inverter with appliances which have strict requirement on power supply, such as precise equipment.